Colorado River, USA: Today, the Federal Energy Regulatory Commission (FERC) received a letter from the Utah Congressional delegation and led by Republican U.S. Senator Orrin Hatch, asking President Trump to ‘Expedite’ the permitting of the Lake Powell Pipeline (Pipeline). The letter is posted here. 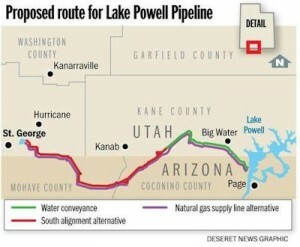 The Pipeline proposes to divert 86,000 acre feet of water (28 billion gallons) out of the Colorado River at Lake Powell every year to fuel and subsidize population growth in Southwest Utah. The letter states that Trump should expedite the Pipeline as a part of his “infrastructure” executive order and make the Pipeline a “high priority”. FERC is the permitting agency for the Pipeline. The Lake Powell Pipeline has been mired in massive cost overruns, permitting delays, and political shenanigans in Utah for years. Projected to cost over $2 billion, the Pipeline would also continue the draining and destruction of the Colorado River which is already under extreme stress and predicted to get worse by every climate change scientist studying the system. Over the last 2 years, news stories have reported about the ‘historic collaboration’ on the Colorado River but have mostly ignored the highly controversial water war raging in the Upper Basin states of Colorado, Utah, and Wyoming, where each state is pitted against each other and proposing to build massive new dams and diversions to rapidly deplete the river. As the levels in Lake Mead and Lake Powell hover near record lows, the Upper Basin states are working feverishly to accelerate the chaos and drain the river even faster. Colorado has proposed the Moffat Project and the Windy Gap Project which together would remove a new 35,000 acre feet of water from the river, Utah is proposing the Lake Powell Pipeline to remove 86,000 acre feet, and Wyoming is proposing the massive Fontenelle Dam expansion which would remove a whopping 150,000 acre feet. Chicken Little Helps Save The Colorado River! Will Colorado Violate The Clean Water Act?